If you run WordPress and are tired of having script kiddies clicking the “forgot password” link and getting emails, just disable it by editing your .htaccess file. If you’re running your own instance you don’t need it anyway. You can easily cache downloaded Python packages locally when they are installed via Pip. Next time you install one of those dependencies, Pip will use the locally cached copy instead of connecting to PyPi. Sometimes it’s helpful to quickly enable logging in a Python application so you can peer into what the libraries you depend on are doing under the hood. Many libraries include logging, but in order to see the messages they rely on you configuring a root level logger in your application’s “main”. It took me longer than I’d hoped to get this set up for a script I was working on to test out some ideas, so hopefully this post will save someone else some time. Just spent far too much time on this little gotcha, hopefully this saves someone a lot of frustration! It’s relatively common for people to put a closing comment to help match up closing tags. I personally don’t care for it because it adds bytes to your HTML and a decent IDE should make it clear which opening and closing tags are paired together. Nevertheless, a lot of people do it, including some people I work with. Both my Eclipse IDE and the Chrome and Safari (WebKit-based) browsers had absolutely no problem with this. But Firefox thinks that a comment open tag has been left open, and it produces mangled HTML as a result! If you are seeing weird behavior in Firefox, check your HTML comments! And then you go to test out your form in Chrome. 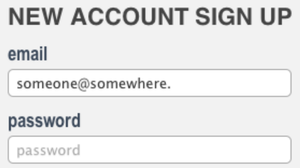 You type in a bogus email address to test your server-side input validation. Where did this come from!?! Chrome apparently tries to do its own form validation. 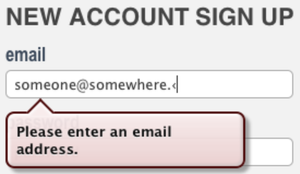 Which is great I guess, but not when you want to do your own custom validation. This is so frustrating, but I am sick with a sore throat and haven’t been able to record. But I am determined to finish, so as soon as I can I will continue!! !